Whether you’re training for a race or you’re just working on staying fit, one major part of any running routine requires staying on top of your hydration. This is as important for a short 3-mile run as it is for a marathon. And the better you’re able to stay hydrated and energized, the better your performance will be. One thing I always say to people I coach is that if you start getting that dry thirsty feeling in your mouth, then you’re already way too dehydrated. It’s far better to keep taking small sips of water on regular intervals. That can either be every 10 or 15 minutes. Or you can set yourself certain mile markers. Either way works, but what’s more important is how you carry the water. When you go for your regular run, you’re also likely to have things like keys, money and a phone on you. These are really annoying to have in your pockets. And even more annoying to hold in your hands. Some people don’t mind running with a bottle in their hand or in a small bag on their back. However, if you regularly go for shorter runs, then you should really consider one of the best running belt reviews on this page. Comfort is a top priority for men and women, and with the Stashbandz that is something you get plenty of. It is a nice and snug fitting thick band that even acts to keep in any belly or hip fat. The reason we think this is the best running belt is because of 4 very generous storage pockets. No matter what you want to bring on a run or hike, it will fit in easily. Each pocket also has a flap that folds over the top of the pockets. This has two benefits. First of all, it reduces the risk of anything falling out. But it also makes it practically impossible for pick pockets to get at your stuff. You can even use it as a travel pouch to keep your valuables safe while on vacation. The tight fit means that nothing in the pockets will bounce around. That is one of the most annoying things you can get with an old fashion style fanny pack. This keeps things snug and safe. For the fashion conscious there are many color combinations available, that way you can match it up with your other gear. And with a reasonable price tag you could even get a few of them to give you more options. The main downside is that there is no water bottle storage really. It would be a bit awkward to place one in these pockets. But the design is suitable for a simple clip- on bottle which works perfectly fine. 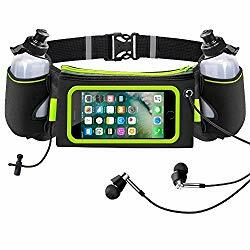 One of the best hydration belt options is this fully featured iRainy product. Whether you’re a runner just getting off the couch, or you go jogging on a daily basis, this product will work wonders. With a water bottle holder on each side you can bring a total of 24 ounces of water. That’s even good enough for some easy access to water if you like trail running. Of course, if you’re on a fitness regime trying to lose some weight then you could quickly see your waist size shrinking. With this option, you can easily make adjustments to the expandable strap. You can fit it as tight as is comfortable for your preference. Because the entire belt is very light you will be able to fill it with your essentials without being weighed down too much. The front pouch has a plastic window so you can place your phone facing out. That way you can see what calls and messages are coming. There is even a very handy hole so you can feed in your headphone cable. For people who don’t like wireless Bluetooth earbuds this is ideal. While the front pocket will fit the majority of phones you might find it a bit tight to get larger cell phones in and out. This can be a little bit annoying. This product is possibly one of the best suitable for those with extra-large phones. This generally can be a pain because the pouches are made very snug to avoid bouncing. But the innovative padding on this model means that you can easily slide your phone in and out. The material is exceptionally light, despite all the padding that it comes with. Within the main pocket, there are 3 smaller pockets. This is ideal for storing keys, change and banking cards separately to make them easier to find. The two included water bottles are very easy to slip in and out of their holders which are placed one on each side. For the darker days of the year you want to make sure that you’re as visible as possible if there is traffic around. To help with this there are reflective strips, which help motorists better see you from further away. Just make sure you have some other reflective wear as well, as belts are generally a bit too small to provide enough reflection. One downside is that the strap adjustment is not that flexible to the smaller end. For small womens waists this might mean that you can’t get it to fit tight enough. This product is one of the most compact iPhone running belt options out there. It comes with two main pockets that have plenty of space for your smartphone, keys, cards, money and even some snacks or an energy gel pouch. Part of the waist strap is elastic which means you get a much tighter but also more comfortable fit. You won’t get that annoying bouncing effect that can be distracting and even painful. Because you’ll likely be breaking into a sweat, you don’t want a belt that will just absorb the sweat. That would make it unhygienic and it could quickly become quite smelly. The pockets are also water resistant. That means that if you head out for a run in the rain, you don’t have to be worried about your belongings getting wet. With the affordable price tag, you really cannot fault the features. The only real downside is that there is no water bottle holder. But you should be able to get a clip-on bottle that will solve that problem. Also, for some people, just having two pouches will not be enough, just depends on how much stuff you plan to bring. For us this is one of the coolest looking products on the list. But don’t be fooled by just looks. There are plenty of products that look great but are just useless. I’ve owned so many of them I lost count. However, the makers of this product are so confident in what they have created, that they offer a lifetime warranty. That’s not something you often see and takes some of the risk out of buying. But at this low price, there really isn’t too much to think about. On each side to the front there is a holder for the included water bottles. This is a nice feature, as you won’t have to go and find a bottle that will fit snug into the holder. For shorter runs or trail hiking this is a great way to have fast access to water. The front pouch is large enough for plus size smartphones. And you’ll find it easy enough to get them in and out. Despite that, you won’t feel your accessories bouncing around, because there is plenty of padding included. The main downside is that it’s not suitable for very slim waists. The straps can’t be adjusted far enough down. For some women and many kids that will make this a less suitable option. This Top Fit product is one of the most innovative and simple solutions for use with touch screen smart phones. Let’s face it, who doesn’t have a touch screen phone these days. But when in it’s in a tight pocket to keep it protected, it’s not that easy to check a message or change your music. The solution is really simple. Make sure that the plastic screen is designed in a way that allows for the phone to still pick up the static from your finger. This will even work for finger print unlocking, so you don’t have to pull it out every time or enter your pass code. There is a pocket on each side with storage space for some belongings. And on a race day you’ll be able to keep snacks and energy gel packs as well. The belt itself fits perfectly for all waist sizes and can easily be adjusted. You will quickly notice that there is no bouncing which can be annoying and sore. Phones with screen sizes up to 5.7 inches will easily fit in the pocket. This includes the majority of plus size phones available today. Just make sure to double check your screen size first. On the downside, you should note that the pockets are not huge and it can be a bit difficult to get stuff out. If you expect to need to get at your stuff a lot then a different pocket design might be better. This is one of the most popular products for many people that go to the gym regularly. It doesn’t provide a huge amount of storage space. But the way the pocket is designed is very convenient. It’s essentially one long pouch with a zip opening at the front. The entire pouch is elasticated which means it tightly wraps around your stuff. This means it won’t bounce around annoyingly. And the pocket will only appear as large as the things you’re storing in it. It’s also ideal for waists from 24 to 47 inches, so you won’t have problems getting this to adjust comfortably. It’s easy to do, and you can quickly make adjustments while you’re running as well. From a color selection point of view this is one of the best possible options you have. And because of the low price you can even buy a few of them to go with different gear you wear for a run. The size of the pocket is the only downside. It would be great if they made it in different pockets sizes as well. Larger phones will only barely fit into the pocket, making it difficult to close and access. If comfort is your main concern, then this is by far the best product to buy. The super stretchy material molds to your body shape and can be easily adjusted to your waist size. The result is absolutely no bouncing or slipping around your waist. Even with larger phones and keys in the pockets you won’t find that they move around much at all. That reduces the distraction and discomfort that comes with friction from a strap or buckle. The pockets are huge. So, if you have a large phone or want to bring a load of energy gel packs and snacks, this is an ideal solution. It’s essentially one large pocket with access on two sides to the front. The only downside to the design is that there is no secure flap or zip. It just means that things could fall out, and it’s not fully protected from pick pockets. Also, the large size does make it a bit warm on hot days, because there is a lot of body contact. To keep all your belongings safe, the material is fully sweat and water resistant. Last thing you want to have happen is for liquids to damage your phone, whether that’s from rain or sweating. For maximum hydration flexibility, this Peak model is just perfect. In many ways, it is the best running hydration belt, mainly down to the innovative design of the bottle holder. Rather than being limited to one size and shape bottle, you can simply use your own or store bought bottle up to 12 ounces in volume. The elasticated design keeps the bottle nice and snug. And there is a safety strap for the top part of the bottle so that it doesn’t slide out. For longer runs you can always stop somewhere for a fresh bottle and simply slide it into place. From a storage perspective, you have a great pocket size. Phones of all sizes will comfortably fit and are protected with padding. And if you prefer using wired earbuds then you can simply feed in the cable through a designated hole. What really stands out with this model is the fact that it has convenient storage slots on the belt. These are the perfect size for safe storage and easy access to energy gel packs. There are two slots on each side, and if you need to add more then you have plenty of room in the main pocket as well. On the downside, the elasticated belt is not really tight enough. You have to make sure you tighten it quite a bit to avoid any movement or bounce. And the front placement of the bottle will take a bit of getting used, as most other products have the bottles on the side. We’ve added this product to the review list because it is quite popular, but at the same time has a few flaws that make it less than ideal. You do get two bottle holders which is great for staying hydrated. But the delivery only includes one bottle which is highly annoying. I don’t know anyone that would want to run with an off-balance belt. So, you have to make sure that order a second bottle at checkout. Overall, there is good storage in the pockets and they are easily accessible. There’s also an easy wired connection for headphones through a small hole in the front. You can adjust it quite a lot from small to larger waist sizes. But even when fully tightened the pocket design results in a bit of bouncing that is annoying and can cause friction. The buckle at the back also seems to cause some pressure points when you wear it for longer runs. Finally, if you have a larger phone, it will fit in the pocket. But don’t count on getting at it quickly to answer a call. It’s very tight fitting and will take a bit of effort to get it out. Overall, we would recommend any of the above products over this one. When you are trying to compare different products, it can become very confusing with all the different marketing language out there. Different companies use different terms to describe the exact same feature. Rather than focus on what the official product specifications say, you should figure out what features you actually need and then look at the different products. To help you with this, we’ve listed out a few features that are most commonly found. Not all of them will likely apply to your needs. But it’s much easier to work out what you should best invest in. Are you going for a daily run, or preparing for a triathlon? Do you use it for hiking trips or just for vacation travel? These are important questions to answer, as they will dictate what other features you need. For example, on a hiking trip you can afford to have a little bit of bounce, as long as you can store plenty of water. But if you go for a daily run in preparation for a marathon or triathlon, then bounce is just not going to be something you experience. For shorter runs you could also look at getting a much smaller product. But that same product would not work well for snacks and energy gels on a long race day. So, your first task is to consciously figure out how often you will use it, whether it’s for running, walking or gym use and how much stuff you will need to store. Most products come in very large ranging adjustments. You can even get some that will suit a 24-inch and 47-inch waist with some really simple adjustments. The important thing to look at is how easy it is to adjust and how tight the fit will be. To make it as tight as possible will reduce the amount of bounce you get. But to be able to do this you really need to make sure there is comfortable padding especially on the hip areas. For the ladies out there this can very easily become a problem if the belt easily slips up. Due to the shape of women’s hips and thighs, this is something that can happen quickly. So, make sure you look at the padding and tightening straps to ensure they will fit comfortably. With most of the above product reviews you have bottle holders and bottles included. The important thing for this is that you want to make sure the belt has either one holder at the front, or one on each side. The reason is you want to make sure that the belt is not off balance. If there is more weight on one side, then it can quickly start rubbing and even bouncing. We’d also say that 12 ounces per bottle is probably the limit to go for if you going to be out running. Anything heavier does become a bit uncomfortable and the water in the bottles splashes around a lot more which becomes distracting. The size and design of the storage pouches is very important. Some products will have one large pocket with some additional internal dividers. These work really well if you want regular access to your stuff. Other options are a pocket each side so you can have your phone separate to your keys to make sure it doesn’t get scratched or damaged. You also want to look at how easy it is to open and close. It should be easy enough for you to do it without stopping. But not too easy for a pick pocket to get access. One really great feature is storage for snacks and energy gel pouches. If you go for longer runs, or on a race day, it’s very important to keep your energy levels up. And the easier you can get access to the pouches when you need them, the less likely you will be to get distracted by fumbling for them. Most runners will usually bring their smartphone and earbuds for a run. Listening to music is a great way to stay entertained and focused on your performance. Picking the right tracks helps as well, as the beat of the music can help you stay in a consistent stride pattern. The only time you really need to be concerned about your phone fitting is if you have one with an extra-large display. Most products above will fit them, but with some of them it will be a very tight fit. That makes getting the phone in and out very difficult. There are also some great new innovations for phone access. For example, the Top Fit Running Belt (item 6 above) has a clear plastic front cover that allows you to still use and control your phone. Even finger print recognition will work. That means you can send messages, make calls and change your music without having to get the phone out. Marathons and triathlons are very demanding on your resources. You will lose tons of fluids. And even if you’ve prepared with carbon loading for the days before the race, you will need to top up during the race. The best thing you can do here is make a few preparations. A triathlon race will start with the swim. It’s important that you top up with fluids before you jump into the water. It might not seem obvious, but you will still be sweating and losing fluids while you’re in the water. We would not suggest wearing any kind of belt for the swim for two reasons. Firstly, it’s not going to be easy to get at it and it will be constantly under water. Secondly, the belt will increase your drag in the water. That means it will slow you down and require more energy than necessary. Just make sure you’ve topped up with water and high energy gels before you head into the water. Now, you obviously want to have your bike prepared and ready to go. That means putting it into an easy gear and having the triathlon cycling shoes already attached (find out more here). These are simple steps that will save a few valuable seconds for the race. You will also want to attach one or two water bottles to your bike. You’re going to start losing a lot more fluids in this stage of the race. Also, have a fully kitted out running belt attached. This should include two small 12-ounce water bottles and as many snacks and energy gels as you will need. This is always a difficult one to work out. Speaking with a professional trainer and dietician will be a great investment. They can tell you exactly what your body will need based on your height, size and gender. For many people this can be the toughest part of the race. Your legs will have worked a lot during the cycle, especially if there are hills involved. That’s why it’s important to have someone support you to have a second running belt kitted out for the final stage. Again, you want to have two small bottles of water or energy drink. Ideally these should have been kept cool to help your body maintain a more comfortable temperature. It also makes it a lot more refreshing. Small energy snacks should also be in the pockets ready to be used strategically at this stage of the race. Just make sure you don’t take in too much at one time. Spacing these things out over time is very important as your stomach can struggle with heavily loads in such an intense rate. The constant movement can make large volumes of food and liquids become very uncomfortable. Keeping a constant eye on your hydration level is one of the most vital things you can do in a race. One tip I learned in my first marathon was to set my watch to alarm every 5 to 10 minutes or less. That way it reminded me to take very regular sips of water, rather than gulp it when I felt thirsty. These days technology can help you even better. Some advanced heart monitor watches can provide you with an alarm at certain distances. That way you could remind yourself at specific mile markers to take a sip of water or a snack. Doing it this way is by far the most efficient and effective way to stay hydrated. It ensures a constant flow of liquids and energy, rather than sudden peaks. Even at large professionally organized races the water and refreshment stands will be spread out at certain distances. But do these refreshment intervals suit your needs? You could get to a water stand and be gasping for a drink, only to drink too much in one go. Or else it’s too early, and you’re concerned that you might need to take in some water to make it to the next one. If you have your own source of water for in between those water stands then you have far better control over your intake. You can take regular small sips when it suits you, rather than when it is available. The harder your body works the more it will sweat. The reason for this is that the sweating helps to cool down your skin and this in turn cools down the blood flowing through your skin. It’s a crucial way of your body to maintain a safe core temperature, which is pushed up during heavy exercise. The pores in your skin will draw on your body fluids to keep a constant level of moisture and cooling. For the average person, the rate of fluid loss from sweating is about 1 liter per hour of exercise. For the intensity of a triathlon this increases and can quickly get to 1.4 liters per hour. That will tell you how much water you have to keep feeding, just to make sure you don’t start to dehydrate. A good thumb rule is to aim for three 12 ounce bottles per hour. That is a pretty constant intake of about an ounce every 2 minutes. For some people that frequent intake can be a bit distracting. But I would not recommend drinking more than 3 ounces of water in one go. It can just become a bit tough on your stomach; even make you feel sick. The aim during the race will be to take very regular small sips of water, rather than gulping at longer intervals. At this stage, you will have a full understanding of why it is important to keep your energy and hydration levels up. That is the case for short training runs as well as a marathon or triathlon race. Being dependent on water stops is not very convenient as they may not be spaced out in intervals that suit your needs. Having water and energy snacks available in a simple running belt will make sure that you have access to them at all times. The above running belt reviews give you a huge selection. And with just a small investment you can make sure that your performance levels stay up. Such a simple gadget can make a huge difference to your results.